As a global leader in the advanced television entertainment, the reputed firm delivers a branded viewing experience to a huge customer base with its interactive content streaming services. To promptly deliver quality, speed, and continuous availability of its services, the firm has put in place a strong and complex IT infrastructure at its data center. With IT teams accessing the data center from two different locations in the United States, managing and monitoring remote access soon became a pressing issue. Since the teams maintained separate password databases, frequent coordination issues surfaced and tracking who had access what resources became difficult. Moreover, continuously monitoring and auditing privileged access to the critical servers in the data centers was equally important. Naturally, the firm decided to deploy a robust privileged account management solution to streamline its data center remote access. 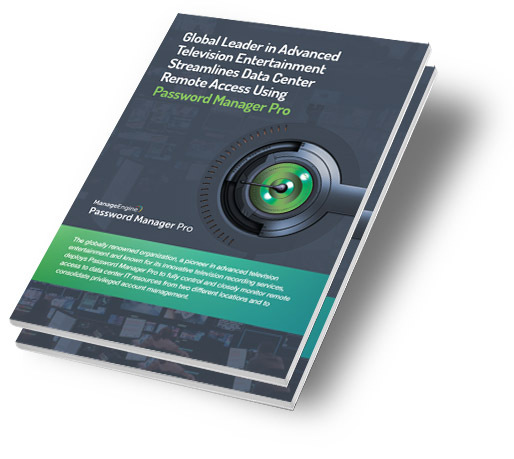 Today, after deploying Password Manager Pro, the firm has established a centralized control on its data center resources and remote access operations.